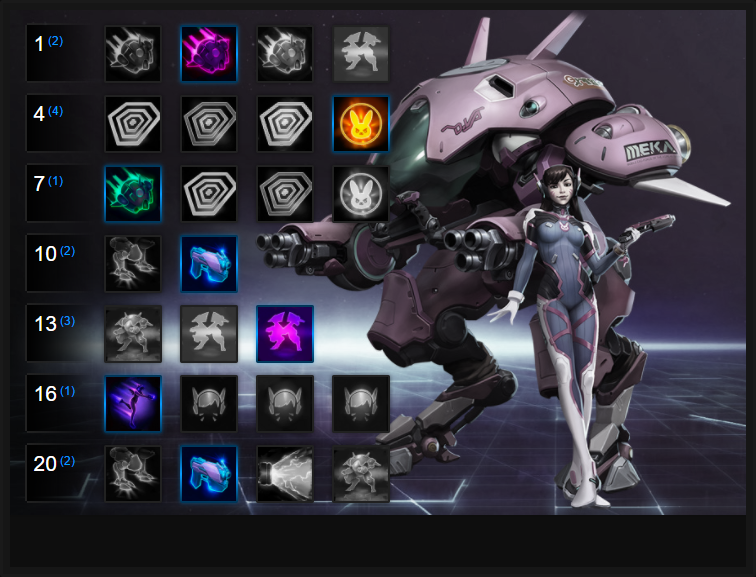 In this D.Va Build Guide, we provide an overview of her strengths, abilities, talents and matchups. D.Va is a ranged warrior that has a kit largely identical to her Overwatch counterpart. With access to tools that allow her to engage, protect allies and zone the enemy, what she lacks in hard crowd control she more than makes up for in other areas. For anyone who has ever played D.Va in Overwatch, her role remains the same here. Acting as an initiator and bruiser, she can quickly engage with her Boosters to knock players aside, before mitigating incoming damage with her Defense Matrix. When she wants to clear an objective, or to zone enemy players, she simply uses her Self-Destruct. What makes D.Va particularly interesting in Heroes of the Storm is the fact her Self-Destruct isn't her heroic ability, instead, that's reserved for Bunny Hop or Big Shot. Both are, though I suspect most will choose Big Shot simply because it ensures she can get back into the action much faster. Finally and when it comes to her Mech, D.Va can not only run and gun, but she's also incredibly difficult to kill. Even if you do destroy her Mech, she can quickly gain it back as long as she keeps firing her pistol. Once she has recalled a new Mech unit, she starts all over again. This does make her particularly slippery, but also means she's highly vulnerable to crowd control when in Pilot Mode. I will add that my time with D.Va has been mixed and while the Public Test Realm isn't an ideal location to test a new hero, she has proved fairly cumbersome on large Battlegrounds due to her lack of mobility, but incredibly strong on small objective based variants (such as Towers of Doom). Mech Mode/Pilot Mode - D.Va's trait (in both its forms) is fundamental to her play. Where Mech Mode is concerned, her trait simply allows her to pilot her Mech. When it's destroyed, she's ejected after nearly a second. It's at this point she is free to move around in Pilot Mode (as just D.Va). Upon destruction of her Mech, D.Va is only worth half the value of a kill, and is then free to run around until she lowers the cooldown of Call Mech. When in Pilot Mode, D.Va can only shoot or use her heroic (see below) and due to the fact she has little else to offer, is incredibly vulnerable. If you can, try to kite, buy time and use your heroic to ensure you get back into your Mech quickly. Boosters (Mech Mode) (Q) - As D.Va's only form of mobility, Boosters are crucial in allowing her to engage, escape and travel the Battleground. With low movement speed and no mount (unless in Pilot Mode) she relies on this perhaps a little too much. The cooldown is low, and allows you to knock enemies away when you hit them. Ideally, you want to be using this as much as possible for getting around but also having it ready for objectives. You don't have to use Boosters to get in amongst the enemy, but knocking players away from capping an objective or to single someone out is valuable. Defense Matrix (Mech Mode) (W) - As your only form of mitigation for you and your team, Defense Matrix and effective use of it is incredibly important. Although it only lasts a brief time, it reduces the damage all allies take during this period by 75%. The only downside to Defense Matrix is the fact that once activated, you cannot turn. To use it effectively, you'll need to keep moving or try to encourage your team to stay in its radius. Ideally, always try to activate Defense Matrix so you're facing the enemy player and/or team. That way, any ranged projectiles sent your way will also be caught and mitigated. Self-Destruct (Mech Mode) (E) - Strictly speaking your Self-Destruct doesn't have a cooldown. Instead, D.Va charges it by using her basic attacks in Mech Mode or gaining a gradual charge as you lose health in your Mech (up to 30%). D.Va attacks incredibly quickly and while her basic damage is low, it does allow her to charge Self-Destruct easily. It should also be noted that when you activate Self-Destruct, your Mech's momentum from Boosters (or a pull from say, Stitches) can allow you to move the Mech while the detonate is counting down. Utilising this momentum is invaluable as it allows you to time you Self-Destruct so that the explosion occurs the moment you need it, rather than simply waiting around for it to happen. Call Mech (Pilot Mode) (E) - Only available when your Mech has been destroyed or after you've used Self-Destruct, Call Mech allows you to summon a new one wherever you are on the Battleground. With a lengthy cooldown (45 seconds) you don't want to have to constantly call a new Mech down. When you do, you want to be sure you're relatively safe to do so as you can't undertake actions in Pilot Mode when climbing inside. If you can and to reduce the cooldown timer on Call Mech, it's a good idea to move to a lane and attack a minion wave or two as it will quickly shave time off your ability. Bunny Hop (Mech Mode Heroic) - Only available to D.Va in Mech Mode, Bunny Hop makes her Unstoppable and during the 4 seconds, she'll bounce in a large radius to slow enemies and deal damage. I've had some success with it on Battlegrounds such as Towers of Doom where players tend to group up, but it does mean that you can't take Big Shot - a tool amazing at significantly reducing the cooldown of your Call Mech. If you do take Bunny Hop, try to use it when the enemy team are low health and likely trying to escape. Big Shot (Pilot Mode Heroic) - I suspect most players will eventually choose Big Shot over Bunny Hop simply because it deals high damage in a line, but also reduces the cooldown of Call Mech by 8 seconds per enemy hero hit. That's a huge chunk and with a very small cooldown and no mana cost, it allows D.Va to jump back into her Mech incredibly quickly - especially if she hits multiple targets at once. Its range isn't too bad either. On smaller Battlegrounds (such as Tomb of the Spider Queen) Hit the Nitrous is a good alternative. It significantly boosts the initial speed of your Booster to 325% (eep!) and increases the damage you deal to players by 50%. Great for bullying one player away from an Objective. Variable: With the majority of her time spent in Mech Mode, Rush-down really a great talent; especially on large Battlegrounds. Reducing the cooldown of Boosters by 5 seconds as long as you don't take damage, it's amazing for allowing you to zip around the Battleground quickly instead of moving at a snails pace. Allowing D.Va to increase the charge on her Self-Destruct by 1% every time an enemy Hero deals damage when inside her Defence Matrix, Fusion Generater provides an additional 1% charge, up to a maximum of 15%. As long as you dive into a group, fire up Defence Matrix, you'll quickly gain a considerable charge. Variable: I've found Get Through This is a valuable talent at 4 as it doubles the length of time Defense Matrix lasts (from 3 to 6 seconds). Considering that's all it does (without any other trade-off) that's a lot of lengthy mitigation as long as you position yourself right. What I also love about the duration increase is the fact in lengthy fights, you can afford to cast it a little earlier than normal and protect allies who might have typically died, or taken late-fight damage. If you're playing aggressively with D.Va, you'll regularly be hunting players down and using your mobile basic attacks while in Mech Mode. Considering the rapid delivery of attacks from your guns, Aggression Matrix is fantastic. Reducing the cooldown of Defense Matrix by 0.25 seconds per basic attack against heroes, it affords amazing up-time on protecting your allies. Variable: Coming Through is a fantastic talent when you need to reach the backline or to gaurentee your escape. By default the knock back from Boosters isn't huge, so increasing this distance by 100% creates some serious space. It's also great on Braxis Holdout for knocking players off a capture point. You will lose your Mech as D.Va and it's important to be able to get back into it as quickly as possible. In Pilot Mode you're very vulnerable and your basic attacks aren't amazing. With a low cooldown and high damage, Big Shot will see you shave significant time off your Call Mech, allowing you to get straight back into the action. Purely to elongate the life of D.Va, Emergency Shielding is very strong. Offering an instant shield if she's about to lose her Mech, it buys her time to receive a clutch heal, finish off an opponent or make it out before returning to Pilot Mode. While the shielding isn't enormous, it'll save you from a couple of basic attacks and can trigger every 15 seconds. Variable: Ablative Armor is a unique talent and one that's hard to judge by the in-game combat text alone. The talent effectively halves damage against you, as long as that damage is less than 4% of your maximum health. As an example, at level 20 D.Va has 4518 health. For Ablative Armor to work, any damage against you would have to deal 225.9 damage or less. Many heroes such as Raynor, Butcher or Kael'thas do much more than this with their basic attacks and abilities. However, many heroes also have very weak basic attacks (such as Nazeeb or Arthas) while also having abilities that are small DOT's (such as Lunara's poison). For that reason, Ablative Armor can be fantastic because it has no cooldown and covers all these sources of damage. If you also combine it with your Defensive Matrix (fundamental to its effectiveness), even heroes who deal massive burst damage above the threshold will see their damage trigger Ablative Armor, significantly lowering their damage output. When D.Va loses her Mech, she's incredibly vulnerable. Nanoweave Suit allows her to gain 50 armor and a 50% increase to her pistol cooldown reduction for 4 seconds. It allows her to survive easily and get back into her Mech quickly. Variable 2: If you're in a sustain composition and securing lots of kills, GG, WP is a brilliant choice. If you secure a kill while in Pilot Mode, you'll instantly be able to recall a new Mech. Fantastic on sustain Battlegrounds such as Battlefield of Eternity or Infernal Shrines. Level 20: Pew! Pew! Pew! Pew! Pew! Pew! allows D.Va to fire her Big Gun three times in rapid succession, allowing each hit to trigger her 8 second cooldown reduction on Call Mech. Against a single player, that's 24 seconds instantly shaved off your cooldown if you land all three. Against multiple, it's an instant Mech every time. Although the damage of your Big Gun is reduced by 50%, it really doesn't matter. Variable: If you've picked up the variable GG, WP, MEKAFALL is worth taking. It allows your Mech to be instant, but also allows you to choose where it lands to deal AOE damage on arrival. Great for fighting in enclosed spaces. These Hero Threat Levels (1 being lowest threat and 10 being highest threat) are to help you determine which enemy Heroes can give you a headache. For the Heroes listed here, take extra care as they're particularly dangerous for D.Va. Arthas: His root combined with his slow aura makes life incredibly difficult for D.Va. You can boost away, but he'll root you again the moment you come back. Valeera: Her stun, ability to evade you with her heroic combined with her potions make Valeera very frustrating to deal with. Alarak: His pull, silence, lightning and heroic abilities can rip D.Va up incredibly quickly - even more so when she's in Pilot Mode. This list of tips and tricks are just a handful of things we think will help your D.Va play. We'll continue to add to the list as required and if you have any tips you'd like to share, let us know in the comments below and we'll place them here. 1. Boosters when in Pilot Mode is your only form of speed and mobility. Without it, you'll walk incredibly slowly around the Battleground. Always have it ready for when an Objective is about to start. 2. Boosters can only affect a hero once - it cannot knock someone back multiple times. After your first knock back, D.Va and her Mech will simply hug the enemy player if Boosters is still active. It's best to knock them back, and reposition rather than keep trying to bump into them. 3. Boosters affects minions and mercenaries. Use it to your advantage if you want to steal a camp or prevent a boss capture. 4. You can cancel Boosters early by pressing Q again. 5. D.Va isn't Unstoppable while using Boosters, but it does prevent her being slowed; great for dealing with heroes such as Lunara or Jaina. 6. Defense Matrix only lowers damage against heroes - it doesn't work on minions or structures. 7. For Defense Matrix to mitigate damage, attacks have to physically come into contact with your Defense Matrix telegraph. Any hits from the side or behind will deal full damage. 8. Remember that you cannot turn once you activate Defense Matrix so try to always face the majority of the enemy team when using it. You can always cancel it if you need to by pressing W a second time. 9. Against dive heroes such as Anub'arak or The Butcher it's worth saving Defense Matrix until they attack your back line. When they do, you can use Booster to knock them away or drop Defense Matrix over your team to protect them. 10. Self-Destruct only charges if you take damage, or if you are dealing basic attacks. Without talents, the quickest way to charge it is to attack minion waves or to get into a team fight and soak damage. 11. Try to always ensure Self-Destruct is ready for a team fight. You may need it to zone the enemy or to use it just before your Mech is destroyed. 12. You can use Boosters > Self-Destruct to fly your explosive Mech towards the enemy. While travelling you can press Q again to stop the Mech where you want it, to perfectly time your detonate. 13. The damage of your Self-Destruct is based on how close enemies are to the center of your Mech. At the edges it still deals massive damage (around 1000). 14. D.Va only has a tiny range in Pilot Mode. If you haven't extended her range with talents, try to flank or just use the poke from your Big Shot. Its range is pretty long. 15. Always try to land Big Shot against multiple targets. If you do, it'll shave huge amounts of time off your Call Mech. 16. When you use Call Mech, try to immediately use Boosters against any enemies near you so that you clear them away from you. 17. When in Pilot Mode and without Call Mech, you're incredibly vulnerable. If you die, you'll suffer a full death timer and award full experience to the enemy team. 18. Even though you only reward 50% experience to the enemy team if you lose your Mech, don't make it your intention to do so. It's still a chunk of experience you want to deny them. Don't aim to die. If neccesary, use Boosters to escape easily. 19. At level 7, taking Coming Through is fantastic if you're against Nazeebo. It allows you to knock aside all his zombies, especially if trapped by the wall.